With around 9 miles of intermediate trails, Sope Creek is one of the most accessible MTB trails near the city of Atlanta. The trail is directional, depending on the day, and form a figure 8 with a bidirectional connector between the top and bottom loops. The top loop, around 2 miles, is flat and perfect for an experienced intermediate and above. The 7 miles bottom loop (also known as Cochran Shoals) is intermediate with flowy, hilly and rocky sections that will give you a good workout. Watch your 10mph speed limit and be friendly to hikers and dogs since this trail gets busy on weekends. Three parking areas, all with a $3 daily fee, are convenient depending on where you are driving from. From the Cochran Shoals and Columns Drive parking areas, follow a quarter mile gravel road until you find the trailhead and go uphill to view the day's direction. From the Paper Mill Road parking area go downhill on the gravel trail past Sibley Pond to main trailhead map. Bathroom and water facilities located at the Cochran Shoals parking area nearest I285. A: There is a parking fee however if you have a Chattahoochee NRA pass your all set. A: Yes - I always park at Cochran Shoals and ride up to the southern entrance of the trail. 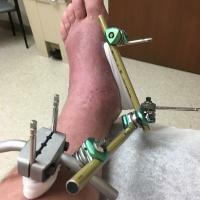 There are two loops connected by a bi-directional section in the middle. If you ride the whole trail you will connect back to where you started and can ride down to the parking lot where you came from easily. 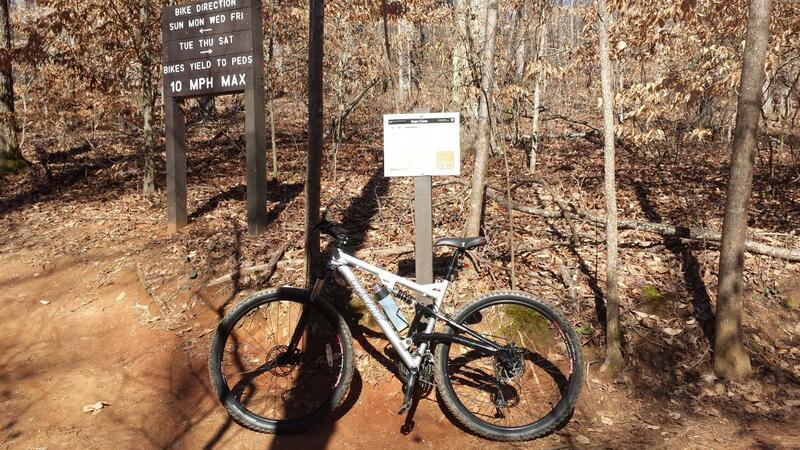 Review: This used to be my favorite trail in GA but heavy erosion took its toll. They are trying to keep the trail rideable by adding briks and cobblestones to cover some of the most eroded areas but it took away a lot of the fun flows. Besides that: there is a 10 mph speed limit (!) and the multitude of pedestrians have right of way. It's a trail that is great for a workout with lots of steep uphills, but real MTB fans better go 20 Miles north. 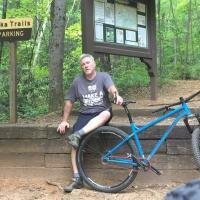 Review: My favorite trail in the metro Atlanta area. Flowy sections, technical sections, flat sections; this trail really has something for everyone. It can be ridden many different ways depending on which day you go as well as where you start. My personal favorite route is the MWFS loop starting at the entrance near the gravel loop of the Cochran Shoals Unit. You get much of the difficult, extended climbing out of the way early and the way back pays off with some very fun descents. Review: Fun, challenging loops that don't get old when repeated. 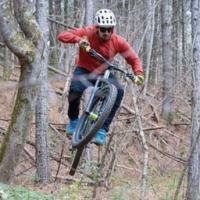 Thoroughly intermediate trails but they can be tackled by cautious beginners. Review: Just wanted to add that the parking is now $5 a day instead of $3, and $40 for an annual pass. Also, in the "main" review, it states that the back loop is flat, which is not the case. There is a decent climb in either direction, and to get back to Cochran Shoals, there is a pretty good climb on the bi-directional as well. Also, watch out for hikers, as there are a lot, mainly on the weekends. Review: Living in the city of Atlanta, with limited time between crazy job, family, kids soccer, etc., I can get to this place from home (Cochran Shoals entrance) in about 15-20 minutes. I love this trail. It has a little bit of everything, and it's a great workout. I do triathlons, but it's scary riding the roads in ATL, so I find this to be a great place to get a good workout, especially on the days where the trail is more uphill. For a harder weekend ride, go on a Friday or Sunday. For a little more downhill, go on a Saturday (there are directional signs). There are runners and hikers, but they are good at moving out of the way. You can do the lower, Cochran Shoals portion and be done in an hour. For a longer ride, do the full upper and lower section. This is an intermediate trail, so be prepared for a good workout with good climbs, sharp switchbacks, wide and narrow singletrack, a little bit of rock gardens, and some gnarly adventure. Review: Really fun trail. A couple of steep climbs and a couple of fun down hill sections. The trail is maintained very well. The flow is great. It is really a fun trail to ride for a quick loop after work. It is wide single track. The only down fall is there are a ton of hikers and joggers. I have nothing against them, it just makes for a busy trail system. Review: First time to ride here. I missed the turnoff for the second loop, so ended up doing the first loop twice. It helps to come out with someone who has been here before. It was a fun ride nonetheless. Review: The trails are pretty fun, but be prepared to encounter lots of other trail users. If you're looking to hammer out the miles, this is NOT the place to do it. 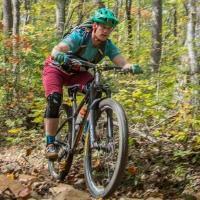 Sope Creek MTB Trail 3.66 out of 5 based on 100 ratings. 100 user reviews.